A delightful evening for a sail. 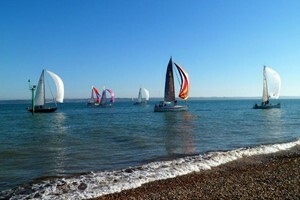 Warm sunshine and a gentle 10 knots of south easterly breeze. Tinker T took over SOOD duties in the absence of Kurketrekker and set a course of a run to Stokes Bay Central, a beat to North Sturbridge and a run home. With only 8 yachts on the water the starts were combined in a single start at 1830. The line had an even spread at the gun with some boats preferring the slacker tide along the shore and others seeking clearer wind a little further out. For those opting to stay close to the shore there was much gybing practice for the crews. The faster boats Jolly Jack Tar and Sunshine soon showed their pace and extended on the small fleet. The tide cheating manoeuvre whilst initially worthwhile lost out to the clearer wind contingent as a breeze line offshore kept them trucking that much faster. The tidal gate at SBC only extended the lead of the faster boats and they hurtled up the beat pulling a significant margin on the pursuing fleet. However everyone knows it is never over until the fat lady sings and thus it was. A large light patch en route to Darling Associates and the finish line slowed the leaders allowing the fleet to close up and the tortoise and hare scenario was proven as Danegeld from the back of the fleet took the chocolates after the numbers were crunched.